Henry Ford was a genius in his time. He had the ability to maximize efficiency through the use of the assembly line in the production of consumer vehicles. He was able to employ a lot of people and the number of cars that came out of the factory was staggering…unheard of in that day. His idea was simple. If each person was trained to do one thing that contributed to the whole, then each person could perfect their seemingly mundane skill. 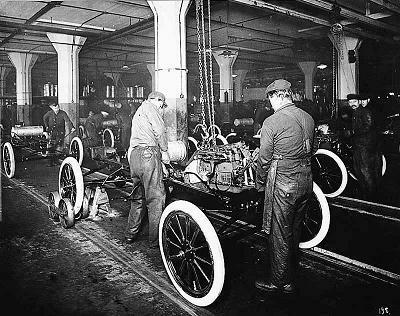 If you would have been an autoworker in the early 1900’s you may have had times in which your skill would have seemed meaningless to you. Perhaps you would only install headlights or tighten a bolt, but if you were sick one day, the work would not get done, and production would slow down. Each worker was extremely valuable. So, let’s say that a particular factory produced 100,000 cars in a year. This would have been impressive in the early days, but what if none of these cars had actually left the factory? The skills of the workers would have been wasted, and the workspace would have been cluttered. The company would need to build bigger warehouses to store all of the cars being produced and eventually the corporation would dissolve due to the fact that the product never left the building. My point? The Church must do more than just sit in the pews and soak up information. God has given every believer special abilities and the mere act of worship is meant to not only praise God but to infuse passion for His work into His creation. Religious assemblies should translate into efficient assembly lines. Get out of the factory and bring the gospel to the world.